‘April rains bring in May flowers’ is a common saying in Canada, especially as everyone awaits the April rains to help wash away the winter snow that had been shoveled to form little mounds around their homes. Whether the plants, especially the tulips and daffodils, whether it rained or not, by end of April they sprout out to mark the beginning of spring. This year around we did not receive many showers in April and it did have a telling effect on the quality and size of tulip plants and flowers. In our garden too, this effect was visible (Please refer image). The tulips and daffodils did not perform too well. Tulips Originated in Persia and Turkey and were brought to Europe in the 16th century. They got their common name from the Turkish word for gauze (with which turbans were wrapped) – reflecting the turban-like appearance of a tulip in full bloom. By the 17th century, the popularity of tulips, particularly in the Netherlands, became so great that the price of a single bulb soared to new heights, causing markets to crash and putting into motion ‘tulip-mania’. Many are even said to have sold their houses and fortresses during the ‘tulip-mania’. Different tulip colors denotes different aspects – yellow tulips symbolizing cheerful thoughts, white conveying forgiveness and purple representing royalty. The Red Tulip became associated with love based on a Turkish legend that a prince named Farhad was love struck by a maiden named Shirin. When Farhad learned that Shirin had been killed, he was so overcome with grief that he killed himself – riding his horse over the edge of a cliff. It is believed that a scarlet tulip sprang up from each droplet of his blood, giving the red tulip the meaning ‘perfect love’. The eleventh wedding anniversary flower is also tulip. It is said that the tulip’s velvety black center represents a lover’s heart, darkened by the heat of passion. 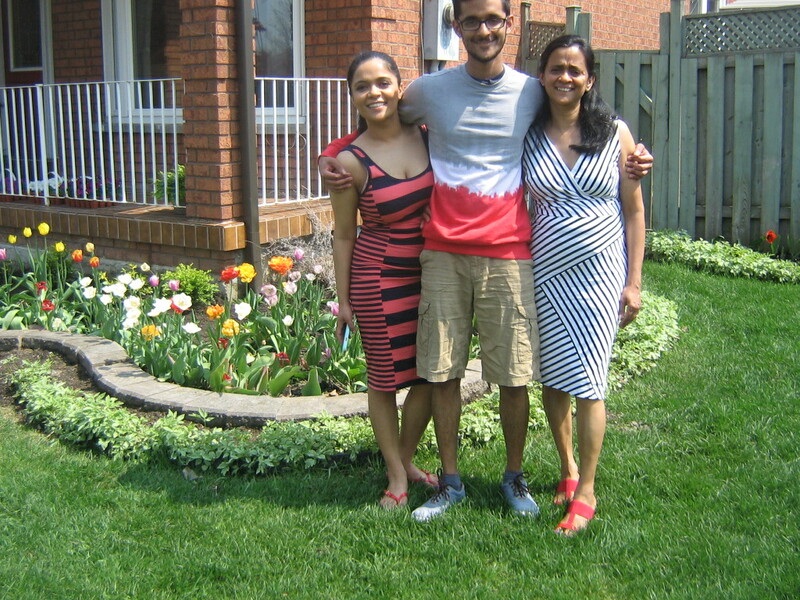 For all our neighbours, friends and family, our garden becomes a place of celebration and many call it ‘Tulip Festival’. Close by in Ottawa, the Capital City of Canada, the largest tulip festival in North America and is held every year in May. This festival is a celebration founded on international friendship with Netherlands, the home of tulips. It all begun in 1945 with the presentation of 100,000 tulip bulbs from Princess Juliana of the Netherlands to Ottawa, Canada’s capital, given in appreciation of the safe haven that members of Holland’s exiled royal family received during World War II in Ottawa and in recognition of the role which Canadian troops played in the liberation of the Netherlands. Since then, the tulip has become Ottawa’s official flower and, each spring, the National Capital Region blooms with magnificent tulip beds planted by the National Capital Commission, attracting hundreds of thousands of visitors. As a thank-you gift, the Netherlands sends more than a million tulips to Ottawa every year. The Canadian Tulip Festival is also a celebration of the return of spring, with over a million tulips in 50 varieties blooming in public spaces across the National Capital Region. The highest concentration of tulips can be viewed in the flower beds of Commissioners Park, on the banks of Dow’s Lake, where 300,000 flowers bloom. During the Festival the international community adds to the pageantry and programming with cultural displays and performances reflecting the diversity of the National Capital community. This year, during the Tulip Festival in Ottawa, an official Canadian delegation, lead by Prime Minister Stephen Harper, consisting mainly of veterans and their relatives, was in the Netherlands to attend a series of ceremonies and events honouring the sacrifices Canadian soldiers made when they liberated the Dutch from Nazi occupation 70 years ago. About a dozen veterans, 90s, and frail flew into Netherlands in a Canadian Armed Forces plane. The aircraft flew trans-Atlantic, unusually low, around 12,000 feet, to avoid a situation where a rapid cabin depressurization might irreparably harm an elderly passenger without the speed or strength to put on an oxygen mask. 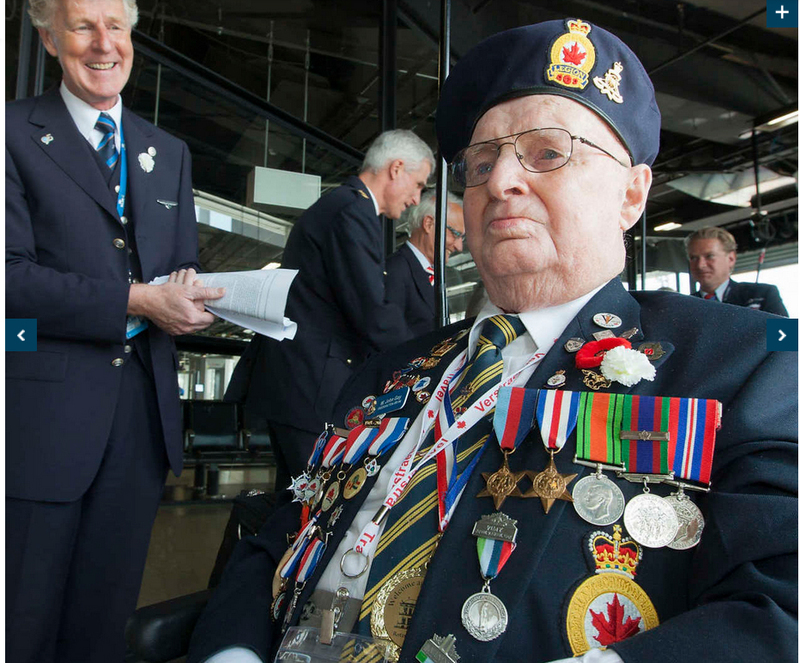 KLM Royal Dutch Airlines flew Canadian Second World War veterans and their families from the airline’s five Canadian gateways – Toronto, Montreal, Vancouver, Calgary and Edmonton – to the Netherlands for the commemorative celebrations. The biggest delegation consisting of 300 participants, including some 40 veterans left from Toronto on May 1. 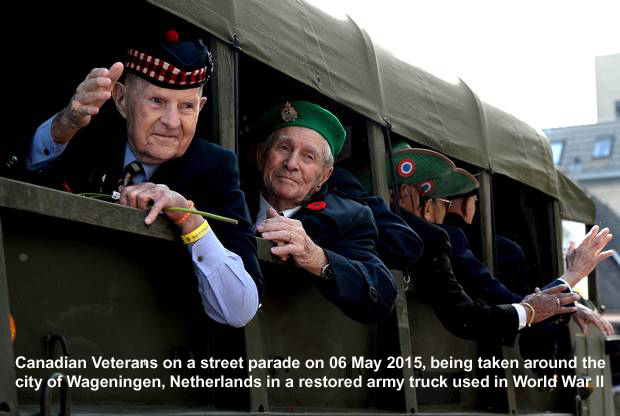 The youngest veterans was 88 (who was 15 when he fought the war as he had forged his documents) and the oldest 97. They were greeted in the boarding area by the flight crew for a pre-departure ceremony. Inside the aircraft, the airline had personalized the seat headrests with Canadian and Dutch flags. The group was acknowledged on numerous occasions during the flight with special announcements, and the crew handed out keepsake souvenirs to the passengers. This is John Gay, ready to board the KLM flight, a cook during WWII and at 97 years old, one of the oldest veterans who participated. He was part of the artillery and helped free up the city of Caen and the Falaise Gap. He cooked for the soldiers in England and Normandy, which got harder and harder because of food supplies and he had to make do with dehydrated potatoes, dehydrated cabbage and meat called “Spam”. He could cook up 6 gallons of stew and would distribute this amongst the soldiers in cans. John is visiting the Netherlands for the 10th time this year, travelling with his son and other family members. To make this flight extra special and show the veterans how much we appreciate and respect them, arrangements were made to honour them. There were special cakes decorated with the Dutch and Canadian flags. Flight attendants handed out and pinned on Carnation Flowers with gratitude and respect. Every veteran got a Delftsblauw salt and pepper shaker set, there were special headrest covers and when we landed at Schiphol airport, the plane was escorted to the gate and the fire brigade welcomed the veterans with a water canon salute, also known as the ‘Shower of Affection’. Just before landing, bagpipe music filled the airplane. On Monday May 04, 2015, the delegation of veterans attended a ceremony at the Holten Canadian War Cemetery. The cemetery is the final resting place for 1,393 Commonwealth soldiers who died during the liberation campaign, many of whom were killed in the late stages of the war as the allies cleared the Netherlands and pushed into Germany. The village of Holten was liberated by Canadians on April 8, 1945 after fierce house to house fighting. Harper said that the bond was forged between Canada and the Netherlands in those dark days still endures. He recalled that each headstone on each cemetery was a stark reminder that doing the right thing often comes at a great cost — but a cost that must be paid. Harper spoke of the great sacrifices made by the now-dwindling war-time generation, saying they understood that some things were worth fighting and dying for; a sentiment that remains today. he added that the heroes who liberated the Netherlands, like the men and women who serve our country today understood that when there arises a great evil, a threat to all the things that define our existence as a free and just people, such enemies must be confronted. I was fortunate to attend the Tulip festival this past weekend and having read this blog, I now have a deeper appreciation for the significance of this annual celebration. Your blog also gives us a greater appreciation for the role and sacrifices of our Canadian armed forces in providing us with the very freedom we enjoy today. Truly we are blessed to live in such a great country!